Moshi Monster’s Poppet fans celebrated the exclusive launch of Poppet’s dedicated boutique at Hamleys this weekend. The toy store hosted the event on Sunday, inviting competition winners to take a first look at the new space stocking Poppet toys, arts and crafts, jewellery and apparel. Fans from across the UK entered Hamleys’ online competition as well as queued out side the store from 9am to be the first to meet Poppet and Mr Moshi. The event showcased all the latest products with demos for the fans, cupcakes, face painting, nail art and a goodie bag to take home. Sophie Dalmedo, Mind Candy retail co-ordinator, said: "The event was a huge success and it was fantastic to see the fans reaction to Poppet first hand. 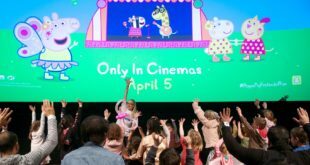 "Poppet is a fashionista and a Moshi on a mission, with new products an an app on it’s way for her, we’re confident she’ll be a hit with girls around the world."